It is high time we talk about Profitmaximizer.co, a malicious scam website that promotes a useless application that is supposed to make money for you by automatically buying and selling stocks online. 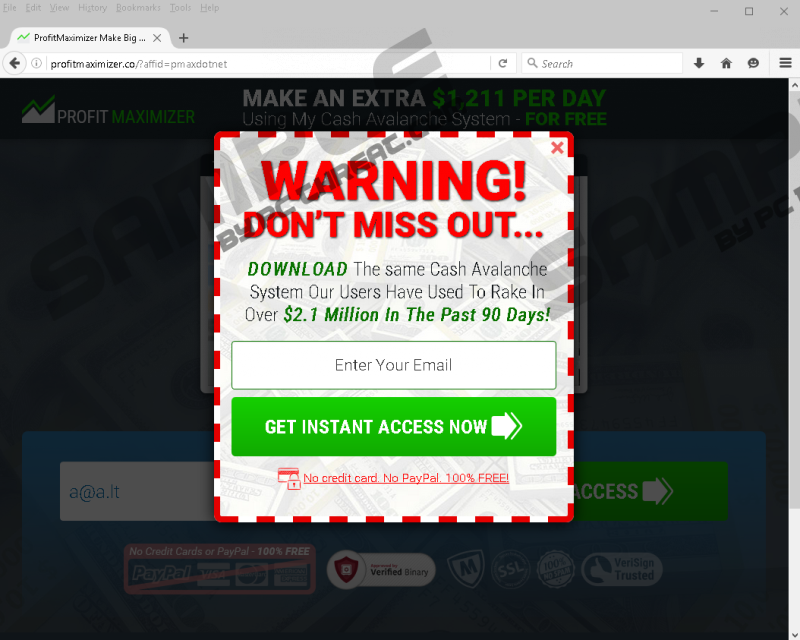 We advise you to remove Profit Maximizer, provided that you have installed it and the program that redirects you to Profitmaximizer.co as we have found that it is most likely promoted by adware-type software. The video featured on the site attempts to smooth talk users into transferring $250 USD first to buy the stocks and begin the trading process. Evidently, it is just a scam, and you should not believe what the narrator says for one second. Applications such as Profit Maximizer are promoted and distributed via deceitful methods. You get this program by entering your email address into the box and clicking “Get Instant Access.” So there is no question about this program’s distribution. However, we are more concerned with how Profitmaximizer.co, in particular, is distributed. 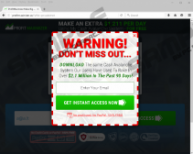 There is no concrete evidence about how it is distributed, but we have received information saying that this scam website is currently being promoted by adware, applications dedicated to show you commercial advertisements intrusively. Adware is bound to promote shady software and websites, and this is exactly the kind of promotions you do not want to see. The software advertising Profitmaximizer.co may be an executable that interacts with the browser or a browser extension. At any rate, we have received information saying that the browser is configured to load this website while you browse the web. Of course, this kind of promotion is intrusive and annoying, and it is supposed to be like this in order to compel you to visit this site. As mentioned, Profitmaximizer.co promotes an automated stock trading application called Profit Maximizer. It is a scam program that does not work and will not make money for you like Mr. James Folley, the man who narrated the promotional video found on the website says it will. Still, the narrator speaks of this application like it is the next best thing since sliced bread and that it will make you millions in the long run. All you have to do is enter your email address on the website and reserve your limited edition copy of Profit Maximizer. If and when you get your program, the scammers will ask you to enter funds into your account to begin trading. However, that will be the end of your 250 dollars because you will not get them back. Furthermore, we think that by entering your email address on the website you can put your computer’s security and your personal privacy at risk. Consider the possibility of receiving email spam from this spam site’s developers or their advertising partners. We warn you that you might receive promotions of similar scam websites and software. Therefore, we suggest that you get rid of the application that promotes Profitmaximizer.co on your browser. In summary, this scam website is designed to compel you to transfer money to the developers of Profit Maximizer and make you think that you will make hundreds of thousands and even millions of dollars by getting insider access to a unique automated stock trading system. However, all you will do is lose money, so we highly recommend that you delete whichever application or browser extension is promoting Profitmaximizer.co. Feel free to consult the guide on how to uninstall an application and remove a browser extension. Furthermore, we believe that it would be a good idea to scan your PC with an anti-malware program just to be sure that there is no unwanted software on it. Simultaneously press Alt+F and select More tools. Click Extensions and find the extension. Type Control Panel in the Run command Prompt and click OK.
Then, go to Uninstall a program. Find and remove the unwanted software. Locate the application and right-click it. Quick & tested solution for Profitmaximizer.co removal.